We all have experiences, challenges, choices and personal stories that we have judged and continue to relive – things that we are unhappy about and especially around this time of the year when we set up our expectations for the Holiday Season such as visiting family or friends – events that can feel more like an ‘obligation’ than an ‘invitation to Share the Magic of the Season’. We have all experienced physical, mental, emotional and spiritual challenges, hardships, aches and pains, that tend to mold us or define us – as who we are or who we believe we are. We feel shame and guilt around our choices during these experiences – consciously or unconsciously – and how we react towards others as well as the parts of ourselves that experienced these challenges. However mostly we think about what we could have, would have, or should have done differently – we try to DO something that will fix, change, and heal the problem. We try to control what happens. We try to find a way so that it never happens again and we often try to do this by doing something differently. Unfortunately this usually falls short of our goal to ‘fix’ the thing because we are in linear time – thinking about the past or worrying about the future where change is almost impossible because we are looking at what happens as a problem – from the perspective that something was ‘Wrong’ and then we are continually recreating it through our fears from the past. But we can’t change, fix or heal anything when we perceive it from the same energy that created it in the first place – a fear created within the first seven years of our lives. These fears are continued because we relive the same energy that created them from the past experiences we had (unconsciously) and we believed the fears were real. And by now you no doubt realize that our perception of what is ‘real’ is often based on our past experiences and the fears that we added to our ‘story’ from our past experiences – ‘stories’ that are not necessarily from the Truth. We try to control what happens. The only way we can be in charge of our responses – and therefore shift our fears – is if we are in the present moment or Flow of Life. We can’t change what happened! We can’t control what is to happen in the future. We can only shift our experience of each happening by changing how we respond to it and this can only be done when we are in the Now Moment – which means we can’t be reliving the past or worrying about the future. We can feel the ever present connection to all that is. I often do this through breath; others can uncover it by reviewing their five senses, meditating etc. Once we are in the present moment we can consciously choose how we would like to respond to things that ‘happen’ in our lives. However, as Emmanuel pointed out, our problem with BEing in the present moment is that often we don’t like it! We aren’t happy with where we are – our current situation and its association with our past physical, mental, emotional and spiritual experiences. Which finally leads us to our heading of ‘Finding Peace’. We have to find a way to make peace with ourselves and our lives just as they are right now. It doesn’t mean we have to enjoy it, like it or condone it – and we most definitely shouldn’t be denying our experiences – we simply need to make peace with our current situation: to find a way to BE compassionate with ourself by sending love and compassion to each area of our self and of our life – or to our Self as a whole. We can send love and compassion for all the thoughts we’ve had, judgements, choices we’ve made and MAKE Peace with them – everything – we can fully accept them because they happened or they are part of who we are right now. Do not try to deny or sugar coat things – simply make peace with who You are – send love and compassion to all those parts of your Self now! 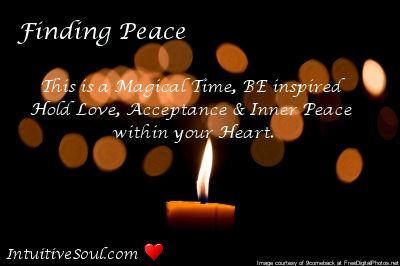 This is a Magical Time, BE inspired Hold Love, Acceptance & Inner Peace within your Heart. What does physical, mental, emotional and spiritual Peace feel like? If you have any resistance to Peace send love and compassion to the resistance – the areas that you are frustrated with; the areas that you feel you need to change, fix, heal and/or that you judge about yourself and others. Give permission to step into peace when you are ready – use your five senses: sight, taste, smell, touch, sounds – how do they help you understand Peace? Can you connect to your Inner Self through your senses? Does your sixth sense establish your connection to Self? However you connect to Self, do you sense Peace or do you sense fear? Release your need to control everything and instead align with ease and peace – align with the present moment. This is a Magical Time, a time which always inspires me to hold Love, Acceptance and Inner Peace within my Heart. I hope that you can capture some of the Magic – and find Peace to Nurture your Divine Essence. Let that Essence flow out into your life now and always – and KNOW You are Worthy! Be part of the True Spirit of the Holidays & Find Peace in the Moment. Happy Holidays from My Heart to Yours! This entry was posted in Blog and tagged Club Miracles, Emmanuel Dagher, Finding Peace, Holiday Magic, Intuitive Counseling, intuitive counselor, Intuitive Soul, Laurie Huston, Magic, Spirit of Christmas, Spirit of Giving. Bookmark the permalink.